A break-action weapon, the Pistola con Caricato features three barrels, complimented by a very high capacity 18-shot cylinder, which is reloaded via two-piece moon clip-type loading devices. They sandwich the 18 rounds between a holding plate and a firing access plate, through which the firing pins strike the cartridges. The weapon has five operational settings, and the selector allows the shooter to choose which firing pin and barrel would be used to fire the gun. 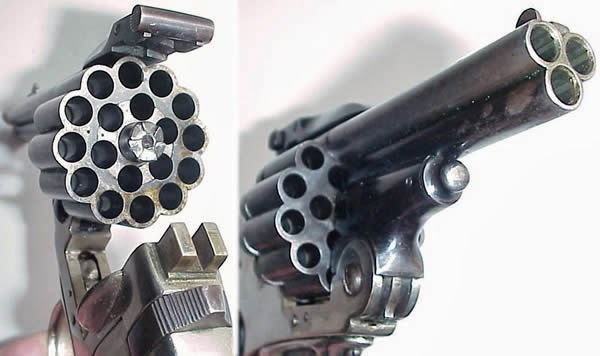 It also has the option to fire from all three barrels at once with one pull of the trigger. It also features a mechanical safety that prevents the hammer from hitting any of the firing pins. Ammo It uses the low-powered, semi-rimmed 6.35×16mm caliber round, which is traditional for light pocket guns. It’s considered the lowest-powered standard cartridge still in manufacture, with the exception of the .22 short. Of course, firing three of them at a time helps to offset their anemic nature. Is it Good Enough to Use? Plenty of people hate on the .25 ACP, claiming its anemic power makes it worthless as a self-defense cartridge. To that, I simply say, I’ve never met anyone who’s volunteered to stroll downrange and catch one, let alone 18 of them. Here’s a similar one from Forgotten Weapon, Ian McCallom goes over a 20-shot Pinfire Revolver, which only has 2 barrels.